Billboards and neon lights advertise the nightlife entertainment in Las Vegas, Nevada. 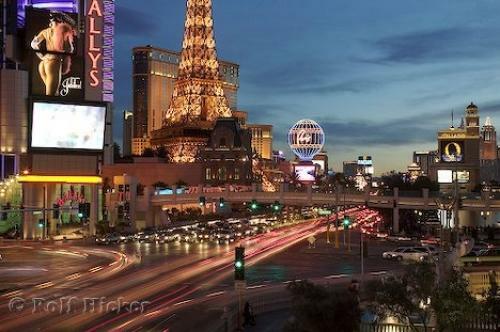 Photo of the illuminated lights of Las Vegas, Nevada that draws attention to some of the city's nightlife. ... This will at least let you experience everything you can without having a plan of attack. You will never get to see the whole list of nightlife events unless you plan on taking an extended vacation in Las Vegas, Nevada.The nightlife is just a portion of the things to see and do in Las Vegas, Nevada and you need to be prepared if you want to take in all the spectacular attractions of Las Vegas.Vegas Strip, Las Vegas, Nevada, USA, North America. I photographed this photo with the digital SLR camera model Canon EOS-1DS, aperture of f/16.0, exposure time of 5/1 sec. on ISO 50, as always I used a original Canon Lens, the focus lenght for this picture was 48mm.